Honey is a very useful ingredient for skin as it best for sensitive skin and has great anti-bacterial effects .It brings glow to skin. Drinking honey with lemon and warm water cleanses the system and makes skin clear. Honey mixed with oatmeal and creme for dry skin and curd for oily skin added alongwith lemon juice is an excellent scrub for any skin.It is also non-allergic. Take cucumber juice and filter it.Then add honey into it and keep aside in a glass bottle.After coming from the sun and early morning clean your face with a cotton pad and wipe it.It acts as a great toner and cleanser at the same time. Lemon juice ,glycerine and honey is a great creme applied to dry scaly skin. For skin burns add honey instantly ,there will be no boil on the skin. Honey,egg yolk and almond oil mixed together and applied on the skin is a great skin moisturizer for the skin and gives that instant glow. For oily skin boil carrot in water and mash them.Then add honey into it and apply to lighten the acne scars and extra oil. 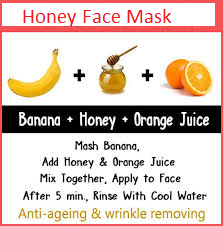 Mashed banana ,salt ,honey and yogurt and apply .Ideal for all skin types. Cocoa powder and honey is a great skin exfoliate mixed with yogurt. 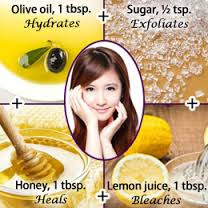 Great recipe to pamper your skin. 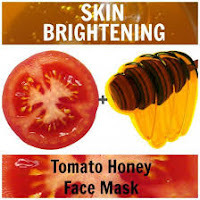 Apply only honey and orange juice to suntan areas to fight suntan. Take bath by adding 4 tbsp honey and salt in water to clean your skin and make it odor free. 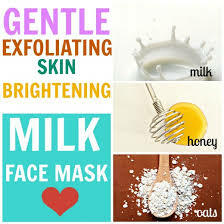 Try all these to make your skin glowing and radiant and healthy . Not only this eating honey is equally good as has anti ageing properties , antibacterial and increases endurance . I personally have been following the diet and the results are very much seen and effective.My complexion has cleared and I drink 1glass warm water mixed with tbsp of honey and lemon and it has helped me shed weight. Natural way to do care for hairs is very good idea that is to follow home made remedies rather then synthetic or chemical products. Thanks a lot .It makes me motivated to write more! very interesting post. i read out the whole post with full interest and found very nice Ayurveda tips for skin care.